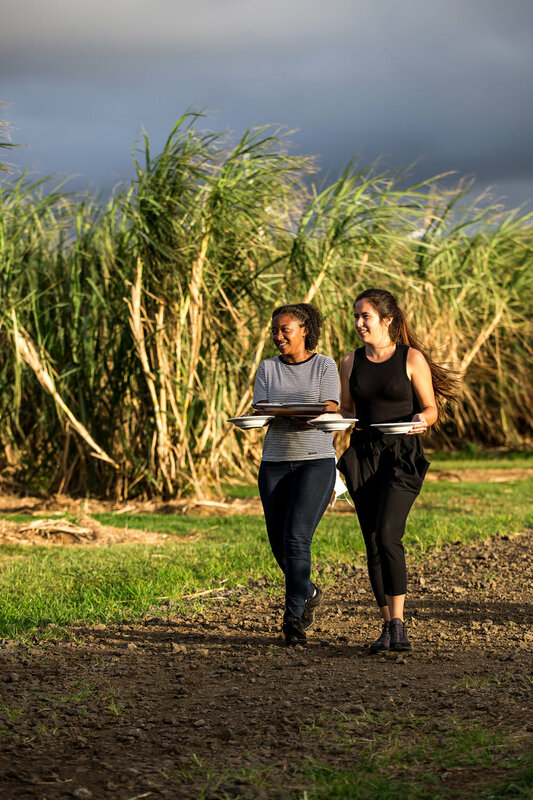 On March 23, we arrived early to the breathtaking sugarcane fields of Kuleana Rum Works, located right by the water, on the Big Island. We strolled around for a bit to take it all in, the sound of the ocean, the breeze, a humpback whale breaching in the distance… It was truly the perfect place to set our table. Shortly after, with a great amount of sunscreen on us and water bottles refilled, we began unloading our cars and setting our stations. We then moved to the dining table and battled the wind for a few hours, until we were able to secure the flowers and greens we sourced from Hilo the day before, to bring some lush to the table. 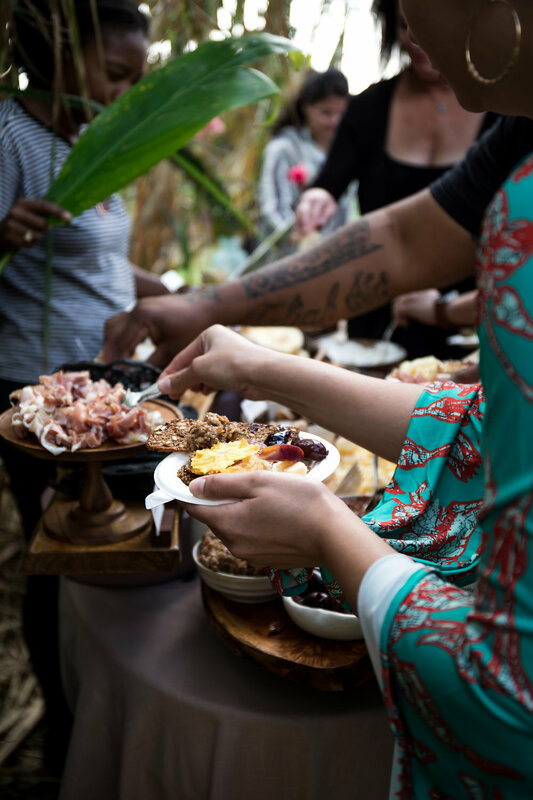 Jess and Kawika Kaula—founders of Hawaii Picnics and Provisions and our chef partners for the night—put the finishing touches to the stunning grazing table and we were off to the races! Among genuine smiles and comments on the gorgeous location, guests made their way to the cocktail area, where a bounty of local delights, including a heavenly honeycomb from Hoʻōla, pulled from the hive just a few hours before the Supper!, and an exquisite Mai Tai crafted by the team at Kuleana Rum Works, with rum made from the very fields we gathered at, made the perfect greeting refreshment. 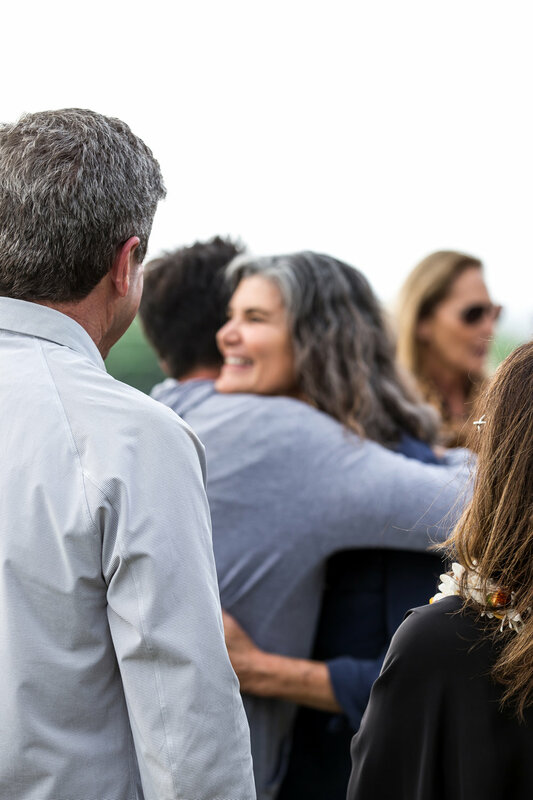 After a while introducing each other and enjoying the food and cocktails, our guests gathered around for a quick introduction to Secret Supper, the dining experience, the chefs, and the incredible land. They then moved to the table to await the first course of the incredible menu. 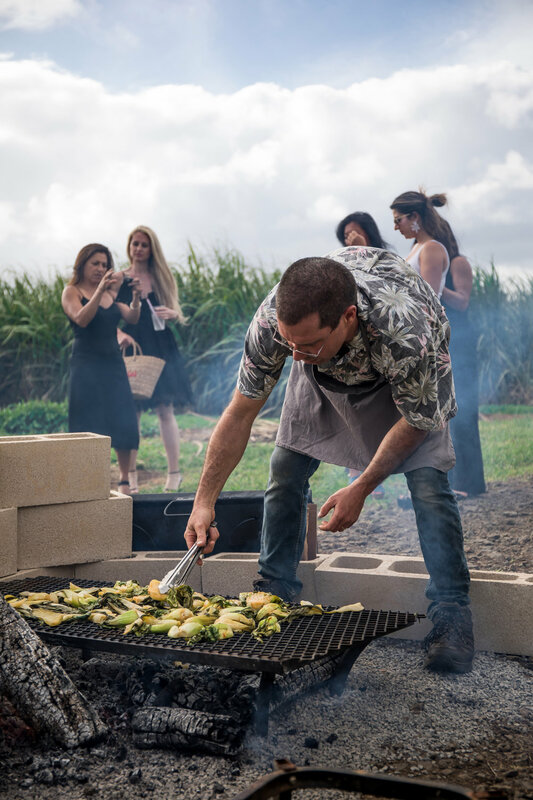 The Hawaii Picnics and Provisions team did an amazing job at putting delicious, local food on the table—have a look at the menu below—from charring vegetables onsite to crafting the perfect mushroom poke for the main course, all paired with exquisite wine from AESOP Wines. It was a great feast! 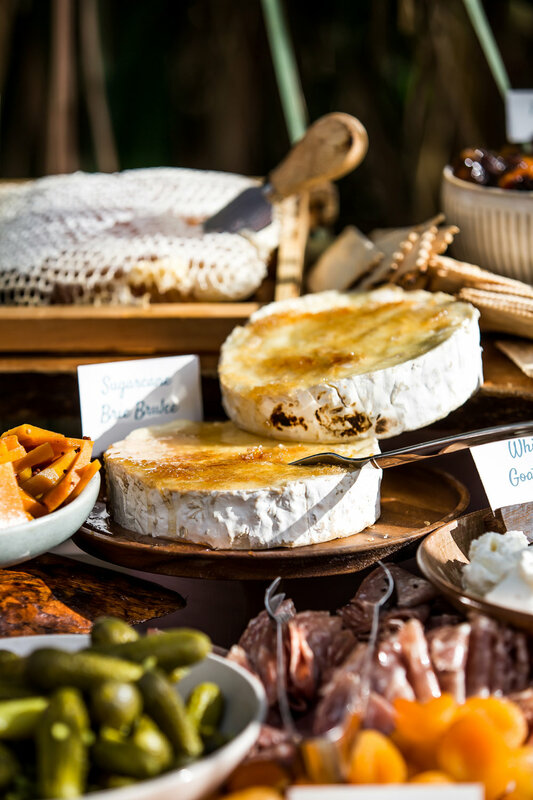 After dessert under the starry sky, guests slowly left the table and the evening came to an end. We were once again on our own in the expansive fields, reflecting on a mind-blowing day. 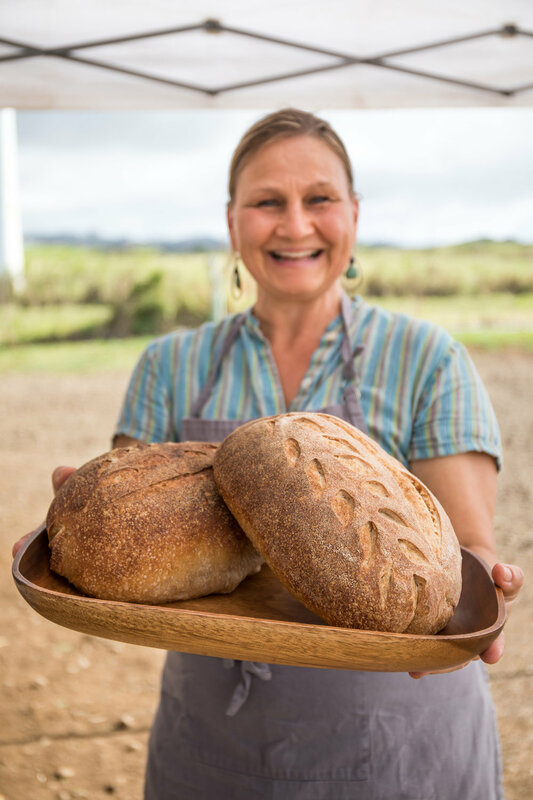 We are most grateful to our adventurous diners, coming from near and far to join our table, and to the land that embraced our passion for people, food, and experiential dining. It does take a village! 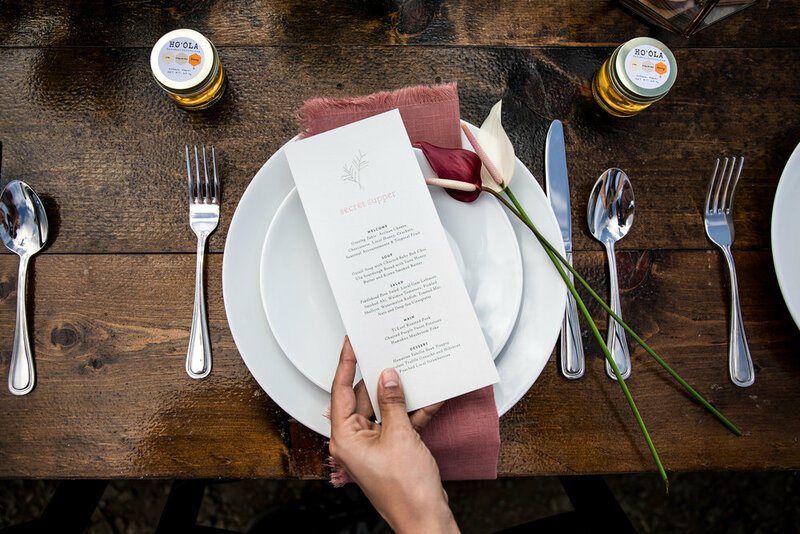 We are profoundly thankful to the partners who helped us make this Supper a reality. With sunburns and a full heart, we returned to Portland. Another Supper for the books, an astonishing way to connect by living life, intentionally.